The motherhouse and St. James Church in Munich, Germany, in 1843. Ten years after the congregation’s relatively unnoticed beginning in Neunburg vorm Wald, Blessed Theresa and her sisters moved into their newly dedicated motherhouse in Munich in 1843. Missionaries from America soon came to visit and to ask if School Sisters of Notre Dame would come to America to teach the children of the German immigrants who were arriving there in rapidly increasing numbers. In June 1847, Blessed Theresa and five companion sisters set out from Munich for St. Mary’s, a settlement of German Catholic immigrants in the forests of Pennsylvania where they hoped to open a school and establish a motherhouse. On their arrival in New York six weeks later, however, they soon learned that there was little promise of success at St. Mary’s. Since the sisters had neither letters of acceptance nor any means of support, an immediate return to Europe was advisable. The first mission of the School Sisters of Notre Dame in North America, located in St. Mary’s, Pennsylvania. 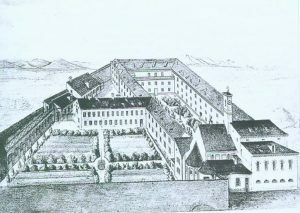 This shows the school and convent in this German Catholic settlement where School Sisters of Notre Dame taught from September 1847 until November 1849. Trusting in God’s call, Blessed Theresa and her sisters did not turn back. 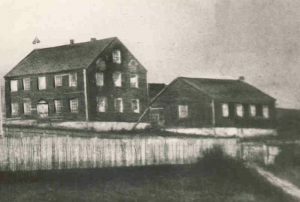 At the end of September, they opened the first mission school for girls in St. Mary’s where they, together with the German settlers, faced hunger and extreme hardship. Immediately convinced that St. Mary’s was not a suitable site for a motherhouse, Blessed Theresa traveled to Baltimore where she was helped by St. John Neumann (1811-1860). Through his efforts, the School Sisters of Notre Dame gained a foothold in Baltimore where they began teaching in three German parish schools in October 1847. In March 1848, 11 additional sisters arrived from Munich. Blessed Theresa, who had been teaching at St. Michael School in Baltimore, was then able to travel more than 2,500 miles with Father John Neumann and Sister M. Caroline Friess in order to examine prospective missions for the congregation in America. The places visited included Detroit, Chicago, and Milwaukee in the Midwest and Buffalo, Rochester, and New York in the East. Blessed Theresa returned to Bavaria later that summer. In January 1849, the third and final group of 10 missionary sisters and candidates arrived from Bavaria. Since American women also were applying for admission to the congregation, the sisters were able to staff six schools by 1850.